Growing up, biscuits were a staple at my Grandparent’s breakfast table. Hot flaky buttery biscuits, smothered in peppery sausage gravy. How can you resist a simple buttery biscuit? Until now, my biscuits have not been adorned with other ingredients. Joy the Baker has brought my biscuit world to a higher level. 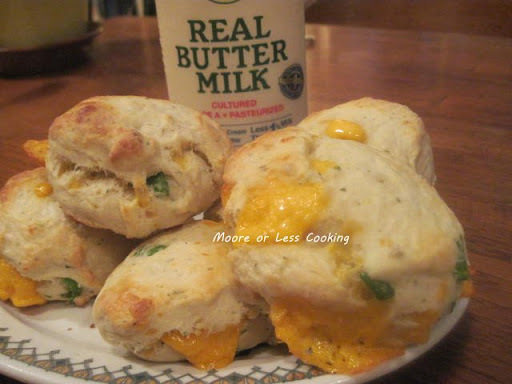 The Cheddar Chive Jalapeno Biscuit is now the King! My mouth is watering now, craving another biscuit! These biscuits are like a meal in of itself. Place a rack in the center and upper third of the oven and preheat oven to 425 degrees. In a small bowl, whisk together flour, sugar, baking powder, cream of tarter and salt. Add butter to the flour mixture. With your fingers or a pastry blender, work the butter into the flour, breaking the small cubes into smaller bits. Once the butter is well incorporated into the flour mixture, the flour will resemble coarse meal. Some chunks will be the size of small pebbles, others will be the size of oat flakes. Toss the cheese mixture into the flour mixture. Create a small well in the center of the flour mixture and add the buttermilk mixture all at once. Toss together with a fork making sure that all of the flour bits are moistened by the buttermilk. Mixture will be shaggy. Dump the biscuit dough into a lightly floured counter and knead for 8 - 10 minutes, just to bring it together into a 1½ inch-thick circle. 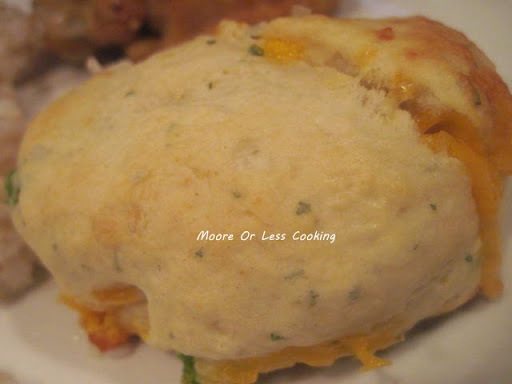 Cut biscuits into squares or use a 2½ inch circle biscuit cutter to cut rounds. If you don't have a round biscuit cutter, you can use a knife to cut the dough into small squares. Gather dough scraps, knead lightly and cut out more biscuits until batter is gone. Place biscuits on prepared baking sheets, brush with buttermilk, sprinkle with sea salt and bake for 12 - 15 minutes. Biscuits are best the day they're made, but can be wrapped, stored at room temperature and served the next day as well. Congrats on doing your first Sundays with Joy post! You are going to love this group… we make the BEST food 🙂 Enjoy your yummy biscuits! We are such a jalapeno kick right now – Mark will love these for Sunday dinner! Kevin can't wait for me to make these! Thanks so much for posting them on Manic Monday!